I'm hoping my participation in a FIST course some years ago qualifies me to post a question on bike design here to folks who understand fit and handling in finer detail perhaps than those on the wider Tri forum. While working on a new Tri bike concept we've realised we could (in theory at least) turn the fit/prescribed bike equation on it's head. What if you could take the rider fit coordinates and then develop the bike geometry (not solely size) according to those coordinates, allowing for optimisation of the front centre/wheelbase and so to rider weight distribution over the front wheel? From experience I've seen pro triathletes who would not qualify as great bike handlers and who could certainly benefit from a more stable bike than may currently be on offer. That must be exacerbated within the age grouper ranks where bike handling experience is even more mixed. If, as suggested here on Slowtwitch (http://www.slowtwitch.com/..._Peak_Aero_6429.html), aero has peaked isn't the next performance area to consider handling? We've done CFD with a scanned rider versus her usual mount of a P5. With her exact same P5 fit we can offer her a range of bikes with Front Centres from 564mm to 615mm. Her 51 P5 is 583. I'd be interested in feedback on the merits (or not!) of the concept and could post a 'fit' chart to show the ranges of fit to FC we could hit if anybody is interested to have a play and give some feedback. How many sizes are you planning on? Cervelo already has FC in ~20mm steps so it's usually not too hard to have a couple of options for weight distribution. Also, for your example - pushing FC from 583 to 615 (with CS the same) has the same impact on weight dist as going back to the old P3/P4 geometry ( 586FC, 380CS) because of the short chainstays. Canyon already have super long FC and bars designed to accommodate that, but then put long CS on so the weight dist no different to normalised geo, you just have a longer WB. So there is already quite fine granularity if one wishes to focus on FC as a fit driver. I'd suggest that you'll have a hard time persuading fitters and consumers that your USP is a feature few understand. Unless it's just part of an overall package that gets all the details right. 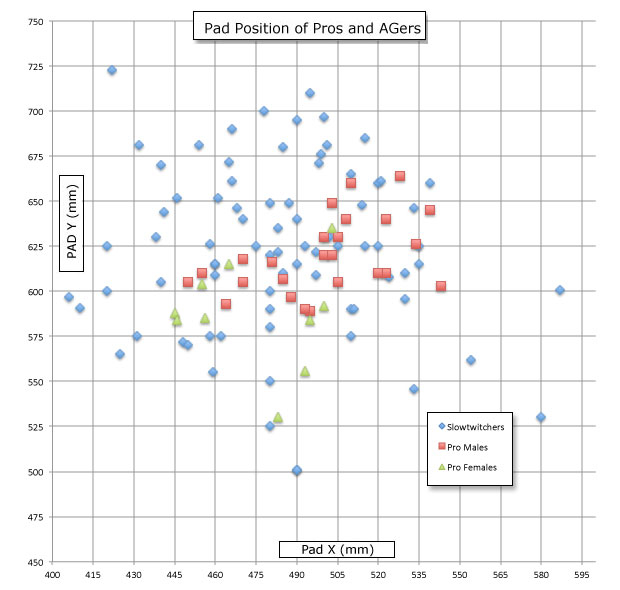 As far as a fit prescriber - aiming for a certain FC is pretty much covered by working to keep the Pad X within a proven range from Frame X. Dan has written about this somewhere on the site, though I can't find it right now. Unless you do something weird with HTA/Rake you're not going to upset that type of calculation. The most important performance area that still isn't covered very well by most manufacturers is giving the rider the capability to get into their best possible position. Nail that and you'll have a strong case. I'm probably not being clear on what we can do, I'm still playing with the concept. However picking up your last point, what we can achieve is that given the rider 'perfect fit' first we can then fit the bike underneath them. Their pad x/y can be placed relatively closer to, or further from, the front wheel axis (= variable stem) which itself can be placed ahead of the BB axis (=variable FC) in a wide range of combinations. The FC step of the Cervelo, and I guess any current frame, is only usable if you jump up or down a size, an action which has other deciding factors before FC would be considered if it ever was. Let's introduce a new parameter; 'front weight offset'. This is going to be pad centre to front wheel axis. The Cervelo for our test rider is 51 with pads pushed forward closer to front wheel axis (FWO: 583-440=143) or 54 with pads pulled back further from front wheel axis (FWO: 602-440=162) So her 'FWO' is 13% greater (further forward) over the front wheel on the shorter frame. We can open that range to 40% shortest to longest. From what you've said and knowing your history I'm guessing you have come up with a clever way to manufacture semi-custom? There is no Y axis for that graph - just showing the distribution of FC already on the market. So with FC extended out to what you've said is nearly the max the weight is more on the front than the 54 P5, or either of the P4 sizes that would fit (at 615 FC it is 43.8%). The long CS kill the balance. Much like the Canyon example. I'm not against what you're trying to do, I'm looking for a P4 so I can step back from the P5 - partially to gain FC so I feel comfortable moving my position forward. What I fear is that your efforts would be wasted as only a handful of people (fitters and consumers) will understand. And 56 sizes will bewilder most. Noteworthy that the BMC, with only 4 sizes, has an equal coverage to bikes with 7 sizes. This is because the M-S and M-L give two reach options at the same stack (much the same as you're proposing) and those options are in the sweetspot of the PXY distribution. Also shows that a more holistic design could get better coverage out of 7 sizes. Adding a couple of sizes and a bit more effort would take it to 100% coverage. I would like the option of tuning handling, if Pad XYZ (+tilt) covers the necessary range. But I doubt it would sway buyers as much as integrated storage/hydration and pretty graphics. I really appreciate the feedback it's so useful in understanding where we might position this thing against the competition. The fundamental design driver initially was a new aero concept for the front end. It's interesting that despite the radical changes to frame shapes of the latest 'hyperbikes' (Ventum/Dimond/Diamondback/P5x etc) that the testing shows very little meaningful difference. The head tube and fork configurations of these bikes (cut the front off where the top tube starts) are almost identical, the main changes being downstream of the front wheel where the rider and thrashing legs take over. As a result of our configuration change the ability to modularise tooling and offer pretty well custom sizing on frame stack and reach dropped out in the wash. However this bike will not accept aftermarket bars and pads, we need to cater for all the possible combinations between frames and the range of FCs you highlight from all the bikes out there with our bike. The 56 options (we can do more :) ) would be invisible to the consumer- They would be the fitters headache in prescribing the final configuration. Each set of fit coordinates has a range within the 56 that could work, extremely short and extremely long could get rejected as could positions with pad stack and reach at either adjustment limit that would restrict later changes. It is interesting that in your comparison the overall weight distribution doesn't change significantly, with our weight actually a bit more on the front (not a bad thing) but the wheel base difference between P5/51 and Custom is 57mm. I would put this in the extreme bracket, and aim for something closer to 20/30mm increase. This would be a super stable ride but still handle well. This is where I can see a parameter of 'front weight offset', or maybe clearer 'pad weight offset' being interesting for comparison, it's simply front centre minus pad reach. When doing a fit you'll need to develop your psyche skills to judge a riders level of confidence Vs actual ability to pinpoint where that 'PWO' should be to suit their riding style! Our target is not another 'hyperbike' but something for age groupers who may not be, (probably aren't), great bike handlers to give them a stable platform that allows them to hold their position comfortably for longer, hold speed and stay relaxed in the aerobars on steeper descents and in unstable weather conditions. It doesn't need to be a 'faster bike' it needs to be efficient in both aero and stability to take time out of their whole event PB. If we can keep them in position and at their at their optimum speed for longer, more relaxed, then they run faster we've been successful. Again many thanks for your time indulging me in this discussion. So Rich as a Triathlon bike fitter, what I look at is what effective seat tube angle I am able to achieve with the seat tube angle of the bike and use of the saddle. Thanks Robert. It seems that's an under looked, (hesitate to say ignored) parameter compared to the emphasis put on the pad X/Y. However it plays into the rider weight Vs position issue. If you consider the rider in isolation independent of bike the three contact points; pads, pedals, saddle actually define weight distribution as sensed by the rider. It's one mass with three mounting points. That mass can then be positioned between the wheels. I'm interested to to see if we can work with the bike design and where the wheels are for any performance benefit that might be derived. Moving that mass b back ( slacker seat post angle?) reduces effective chain stay while increasing effective front centre and vice versa. What we are aiming for is to take that bike independent position, and then put the bike under it, rather than starting with the bike. Give us your fit (position of three contact points) and based on the BB we know where you are in space. Then we can try variations of our bike under you to define you on the bike as a complete system with a front centre to give the combination of stability and agility to suit. Rich, as a fitter I'm not sure your FC customization is worth the trouble/expense I imagine it is. One reason is that handling just isn't a major feature/characteristic of tri bikes -- how much handling is done in a triathlon? Granted, some bikes are a little more stable than others, and FC would contribute to that -- but it's just not a big driver of buying decisions...especially compared to aerodynamics (which I grant you is overhyped). It seems to me that the biggest handling problems occur with an ill-fitting frame, which requires an unnatural stem or radical alteration of the elbow rest position. If we could just get AG-ers to actually GET fitted before buying, that would solve 75% of the problems. Now, there are definitely a small percentage of AG-ers who really don't fit most of the stock frames out there, meaning we're having to make those radical alterations that negatively affect handling/stability. Although Dan Empfield would probably say that we should make them assume a classic frame position, realistically they just can't do it -- and that's why I sold so many custom Guru tri bikes over the years (and lament their demise). But again, even for those who need custom stack/reach, I'm not sure FC measurement requires many options -- even if I felt confident of what each of those options would do to the ride...which I don't. Lastly, I still fit mostly AG'ers who bought their bikes without pre-fitting: for those masses, ADJUSTABILITY of the front end is what we crave, but so often lack. If all those proprietary aerobars and aero stems could be easily swapped or adjusted, this fitter's life would be a lot easier (and more riders would be happy). Let's face it, what triathletes want from their bike is speed -- and not much else. If you want to be successful selling tri bikes, make it aero, make it LOOK aero, and put it under some top pros. Sad to say, those (and price, of course) seem to be the buying criteria for most triathletes. Just my 2 cents...I don't build 'em, I just fit 'em. Hi Doug, thanks for the feedback, you are affirming a lot of what we have been discussing internally, and whether what we have is actually 'a thing' or not. One of the reasons for coming on here and having the discussion it's easy to convince yourself you have something special not so easy to convince others! The concept is based around a new look at the aero at the front of the bike. All of our work up to now has been CFD proof of concept of the aero. The ability to tune FC, or at least bring it into the fit/sizing equation, is a side effect of that. There's no penalty for us to chase it in parallel to the aero gains we see manipulating the bike under the rider. I also wonder how much it doesn't currently figure is down to the fact that unless you look at a range of bikes from a range of manufacturers, as highlighted by cyclenutnz above, with FC specifically in mind then you're never going to see it or understand what a difference it might make to you and how you ride. One thing for sure is that you will need to come to us with a fit first.